Here is a list of Filipino festivals, fiestas and local celebrations in the month of September 2014. A festival highlighting the province’s foundation anniversary. Activities include civic parade, ethnic dances presentations, sports activities held in tourism attractions site and agri-trade fair. 102 Anniversary of Baguio as Chartered City. The Philippine Commission adopted Act No. 1963 on September 1, 1909 wherein the Act transformed the once rural mountain territory into a chartered city. Savor the delights offered by Cabatuan’s Tinu-om--- a local soup that has rapidly gained popularity. Using native chicken as its principal ingredient, customers come in groups gathering earlier than mealtime to take pleasure in tasting the dish. Delectable servings of this local cuisine is matched with a myriad of special events such as cooking demonstrations, other culinary delights and the newly-formatted street dancing competition. Hirinugyaw, a street dancing festivity participated by various agencies and non-governmental organizations in the Municipality of Cabatuan. This activity serves as the opening salvo of the 10-day celebration of the Feast of San Nicolas de Tolentino on September 1-10 of every year. Ceremonial dance offering of the union of the Maranao men and Higa-onon women in marriage as well as the offering of their union and harvest to the patron saint. Peace commemoration of the end of World War II in the Philippines with the surrender of Gen. Yamashita at Kiangan, Ifugao. The first successful show of revolutionary force of Novo Ecijanos happened in San Isidro, known and celebrated today as "The First Cry of Nueva Ecija. The bravery and heroism of the Novo Eciajnos in the revolutionary movement has been reflected as one of the eight rays of the sun in the Philippine Flag. 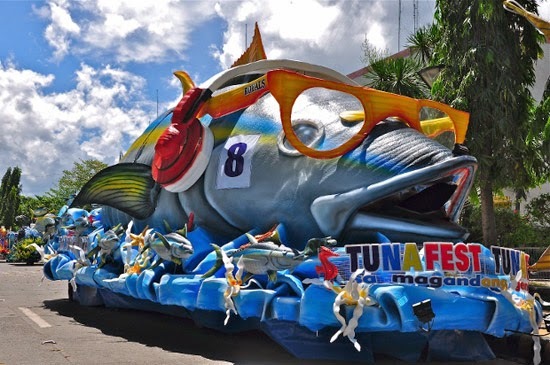 General Santos City Tuna festival, taking its pride to the fishing industry as the major economic activity, is the people’s way of commemorating the city’s Charter Anniversary. Tuna parade and such other activities featuring the different tuna products and the sumptuous Sashimi Night made up the festivities. A festival of oneness among the different tribes of the municipality showcasing indigenous art, music and dances. Buyloganay” is a word typical of an Ivisan culture characterized by the gesture of unity and cooperation. It is celebrated every September 10 in honor of its patron saint, St. Nicholas of Tolentino. Celebrating the bounties of nature and underscoring Dauin’s campaign to conserve its natural resources and attractions. Street dancing and field presentations by all the clustered barangays of the municipality. This colourful festival takes its name from the local term 'Sarakiki' which describes the frenzied movements of a rooster as it tries to court a hen or challenge another rooster to a fight. “Hadang” meanwhile refers to the olden day rituals performed by the locals as offering to the gods. Participants perform the rhythmic dance during the festival which is thought to cure the sick and bring a good harvest. A mythical presentation of how the image of the Blessed Virgin Mary was mysteriously transported to Borongan from Portugal and its connection to the Lady in White who frequented the Hamorawon Spring and caused its water to miraculously heal the locals. The festival is held in line with the celebration of the Fiesta of Borongan City. Other socio-cultural activities are likewise held during the week. A festival based on the epic of Busig-On of Labo town which exemplifies heroism and Bicolano values. The festival features the town’s distinct historical values and sentiments through talent and skills competition featuring the town’s places of interest. A festival that commemorates the town’s founding anniversary every September 16 featuring a cultural shows and indigenous games. Series of activities are lined up in this weeklong festivity. It starts with the opening of a “Taboan sa Dakbayan” which displays the city’s abundant products, followed by various cultural and sports activities, and culminates with a “Lechonan”, “Hudyaka sa Kadalanan” and Pista Kadig’garan which is the highlight of the festival. Tambobo is a Hiligaynon term for “a storehouse, warehouse or a storage structure for agricultural products, or other goods that are stored and kept until a demand or need arises.” The festival, as the term denotes, is the presentation of the municipality’s incomparable and unequalled bliss of human, material and natural wealth. Witness and enjoy its cultural performances marked by a lavish feast thanking God for the crops that would sustain their community. A three-day celebration in commemoration of the death anniversary of the city’s patron saint San Nicholas de Tolentino and in connection with the city’s arts and culture week celebration. It features Adlaw sang Kabataan, employees cultural night, visual arts exhibit by the local artists of Talisay and Negros, Dep. Ed. Cultural contest, Civic Military Parade, fun ride and the Minuluan Street Dancing Competition in a live drum beat which tells about great heroes and rich history of Talisay. A one week celebration featuring the history of Bulacan, exhibits of Bulacan products. Cooking contest, on the spot painting contest, and many others. A festival of arts and culture in honor of the patron saint of the province, Our Lady of Victory. Showcases the traditional arts of "Balagtasan", folk dances and "kundiman" amidst a display of Singkaban arches. The festival is celebrated in conjunction with the "Linggo ng Bulakan". The Parada ng Kakanin was introduced by Monsigñor Manuel Balbago for the celebration of the foundation day of Nuestra Señora de Aranzazu. After the parade, delicacies were given to all for free. Flomlok is a B’laan word which means “hunting ground”. The people of Polomolok commemorate a once rich hunting ground by showcasing its products and a mix of socio-cultural presentations. Polomolok is the home of DOLE Philippines, Inc.
An annula celebration of the foundation anniversary of the Municiplaity of Tupi. Festivities includes street dancing and a parade of “Karitons” drawn by carabaos. Plaridel became a municipality in 1907 and its original name was Langaan, after the river which drains along its shorelines. Coconut and rice are the town’s main crop. Municipal fisheries produce more than enough fish for its need. A yearly thanksgiving celebration for the patron “Impong Kulas” de Tolentino. It is similar to the celebration of the Ati-atihan of Kalibo, Aklan and Sinulog of Cebu. It is also to recognize “baklad” which is the main work of the people from Brgy. Cupang and Brgy. Buli. Baklad is fishing on the lake, which is a part of the festival. 15 - km beach clean up along the shoreline of Tacloban City with community volunteers as participants held in line with the celebration of the International Coastal Clean Up Day. Started since 1998. A day long Mardi Gras marked by street dancing festivities. A Surigaonon’s way of thanksgiving for the bountiful blessings and celebration in honor of the city’s Patron saint San Nicolas de Tolentino performed through music and dance. A festival of entertainment featuring all native dances performed at the streets by schools and barangay communities. Other highlights are school band competition, live band concerts and awarding of outstanding Naujeños. Bansaulog Festival, which means “Kasaulogan sa Bansalan”, a week long celebration in honor of the town’s Foundation Day, with Drum and Lyre Presentation , Cheerdance Presentation, Street Dancing Presentation showcasing the Bagobo cultural heritage, Little Miss Tourism Pageant , Hiphop Dance Competition and Agri Day showcasing the Agricultural products of the Municipality. It commemorates a historical event during the Philippine-American War when Filipino revolutionaries staged their first major victory during the second-phase of the Philippine Revolution – the Filipino-American War. Kapakyanan (abundance) Festival focuses on the bountiful harvest of fruits and crops. Its highlights are the street dancing event and beauty pageant adopting agriculture as the central theme. Street dancing parade and competition. A street reenactment on the transfer of image of Our Lady of Peñafrancia from her home shrine to the Naga Cathedral. The festivity is named after the devotees who accompany and carry the Virgin’s image. Bansaulog meaning Kasaulogan sa Bansalan. Showcasing Street Dancing, Drums & Buggle/Lyre competition, Cheer Dancing, Agri Trade Fair, Job Fair & Search for Miss Tourism. A week-long activities to commemorate the charter day of Bislig. A religious festival honoring the feast day of Our Lady of Peñafrancia, Patroness of the Bicol Region. The festivity begins on the second Friday of September when the image of the Virgin of Peñafrancia is carried by hundreds of male devotees from her shrine to Naga Cathedral. Main highlight is the fluvial procession along the Naga River. Araw ng Siquijor is the province’s charter day celebration with week long activities that starts on the 12th of the month. Parade, trade fairs, sports competition, cultural presentations performed by the different schools, search for Ms. Siquijor were the main features of the event which was capped with a SOLILI street dancing, depicting the marriage ritual of the Siquijodnons. This festival is a toast to the hot spring bath of Los Baños coinciding with the founding anniversary of the Municipality of Los Banos, which features science discovery exhibit, beauty pageant, street dancing competition and Makiling Quest Adventure Race. “Talakundong” is derived from an Ilonggo word “kudong” which means head covering. It is a neo-ethnic cultural spectacles show in hilarious street dancing and exhibition of “Kudong” accompanied by exotic sound of percussion instruments. The week long festivities open with a float parade and agro-industrial fair showcasing Tacurong’s best agricultural and industrial products. A fiesta in honor of Nuestra Señora del Rosario. Pilgrims from the neighboring areas culminate in a fluvial procession at the Rio Grande de Mindanao with their images of the patron Saints. It is the only Peñafrrancia festival in Mindanao. Karansa is a dance expressing one’s joy and happiness performed in 4 basic steps: the kiay, karag, kurug and kurahay that jibes with the Karansa official beat. It is celebrated during the city’s annual town fiesta in honor of Sto. Tomas de Villanueva. Among the highlights is a street dancing and showdown competition with the performers dressed in colorful vibrant costumes. The festival is in celebration of the town’s annual fiesta. Featured activities include a trade fair, livelihood forum and a street dancing competition participated in by the different barangays with the dance movement depicting the various livelihood program of the town. An annual event of thanksgiving of the lumads, done in the river as their only means of access before in transporting their goods and a source of livelihood and drinking water. The annual celebration of Panabo’s mixed culture as well as in thanksgiving of the bounty provided thru the produce of the city’s OTOP (banana) as interpreted in various shows, presentations, exhibits and showdowns. Highlights the coconut products of the town in an agri-industrial trade fair and other activities, the town having the most number of coconut trees in the region based on a survey by the provincial agriculturist office of Cagayan. The Municipality of Dao celebrates its annual feast every September 20-22 of the year to honor the town’s patron saint, Sto. Tomas de Villanueva. “PASALAMAT” is the annual theme of town’s fiesta celebration. The occasion is an auspicious opportunity to highlight town’s rich culture and heritage, strengthen Daonhons solidarity as a community, and as well as thanksgiving to God Almighty for the good health and prosperity received through His blessings. A week-long celebration featuring Lakbay-Silay para sa kabataan; tourism photo exhibit; food discount in restaurants, museums, and pension houses; lecture series on environment care and tourist attractions; and awarding of certificates of recognition to deserving tourism-oriented establishments. Was conceived to give identity to the Tapaznons’ festivities. It is coined based on the people’s generosity of heart and the idea of “you’ll help me and I’ll help you” which is reflected in their way of life. “Pagpatabang” is one valuable trait of Tapaznons when it comes to some occasional time of hard work such as working in the farm during planting and harvesting season, transferring of the house from one place to another, preparing foods during thanksgiving and many more. This bayanihan spirit is very common among the Tapaznons simple way of life. Yearly convergence of all tribal leaders in the province higlighted with the performance of authentic tribal rituals by the tribal priests. Feast of Our lady of Casasay, patroness of the Filipino Chinese, whose image journeys annually from Batangas and its enshrined at the Ma-cho Temple at Ilocanos Norte, San Fernando City, La union . Tawi-Tawi, the Seaweeds Capital of the Philippines and Carrageenan Capital of the World, celebrates the Agal-Agal (Seaweeds) Festival every 25th of September. This is a cultural extravaganza showcasing the rich history and culture of the Sama, Badjao, Jama Mapun and Tausug of southern Philippines through a colourful street dancing and parade of floats all using the Badjao LEPA or houseboat as the main structural design. Participants from the 11 municipalities of Tawi-Tawi dance the traditional dances Tawi-Tawi and Sulu like the pangalay, kuntao, silat, Igal to the accompaniment of native musical instruments and percussions like kulingtangan, agong and gandang. Dancers would be in their colourful native attires adorned with seaweeds and other marine products. This festival is the highlight of the several days of festivities coinciding with the Kamahardikaan Tawi-Tawi, the Founding Anniversary of this Province. Agal-Agal (Seaweeds) is used as the representative emblem to promote Tawi-Tawi as a Tourism Destination in this southernmost frontier of the Philippines and front door to the BIMP EAGA. Being part of the Coral Triangle, it is considered to be the center of marine biodiversity and has some of the interesting dive spots in the country. Tawi-Tawi is also the first seat of Islam in the country. Other activities of the Kamahardikaan include the fluvial parade and regatta, Search of the Budjang Tawi-Tawi (Miss Tawi-Tawi) and Grand Cultural Parade on the 27th. In keeping with the idea of celebrating a bountiful harvest, the town of Alimodian designated a special day of thanksgiving to express their gratitude for God’s blessings. Anihan, coined from a Filipino word “anii“or “harvest” is a serious religious occasion for the people in the community. Celebrated in line with the towns’ patronal fiesta, the festival features their long-observed customs and traditions. Addition activities include Agro-Industrial Fair, Garden Show and Food Festival. The gem of the exhibition is the cultural performance/ competition. Description The Anihan Festival is a rendezvous of the people of Lobo represented by all the barangays that showcase various products being produced in their barangays. The representatives doing the street dancing are dressed in beautiful costumes. Search for best costume is also being done with equivalent price for the winner. Street dance showcasing the banig (mats), the unquestioned identity of Basey, Samar. A dance ritual showcasing Mahaplag’s agricultural blessings and bountiful harvest. Kaplag is a Visayan word which means “Can Find”. Pagay Festival is celebrated to observe the founding anniversary of the town of Alicia and highlight the town’s production of Pagay in Ilocano which means Palay. A stage drama depicting the celestial battle of the forces of Lucifer against the angels of God.It is one of the remaining stage palys of the zarzuela genre in the country today and is considered one of the most important highlight of the festivities. The Pitlagong festival of Argao is a tribute to the tradition of townsfolk faith, celebrations, food, work, livelihood, arts and crafts. Pitlagong is an instrument for cleaning the sugong (bamboo container for tuba) which is very important to the taste and quality of tuba (coconut wine). Tuba is what Rajah Humabon offered to our first Spanish visitors led by Fernando Magallanes. And was likewise offered to our ancestral Gods before becoming Christians. It is a local dance art festival that originated from the graceful movements of hovering birds known as seagulls or the LAPAY, found abundant in Barangay Bantigue, Masbate. Flocks of lapay seagulls created a marvelopus scenery and inspired the old folks to come up with a local folk dance, that since then has exited and has become an important aspect of the local culture of the people of Brgy. Bantigue and the entire Masbate. ‘Sinu-og Estokada’ portrays the victory of the Christian militia over the marauding pirates and likewise depicts the celestial conflict of good and evil. Estokada means fencing or fighting with bladed instruments. The fencing movements were modified to keep in time with a regular beat. The street dancing participants are costumed either as good or rebellious angels. A colorful celebration of the feast day of Archangel St. Rafael, highlighted by a parade, and streetdancing participated by school children in San Rafael, wearing different versions of angel costumes. A thanks giving and tableau presentation through street dancing parade and competition. The annual Tumandok celebration includes many imaginative and colorful displays of municipal showcases from tourism students of partner-tourism schools in Iloilo. This festive weeklong event is a showcase of product, destination and cultural performances. Organized by the Iloilo Provincial Government through the Iloilo Tourism Officers Association (ITOA) the event is a localized version of WOW Philippines and Philippine Travel Mart aimed at establishing a broad network of cooperative partners in the province.